Cool Collectibles Are Added Weekly. 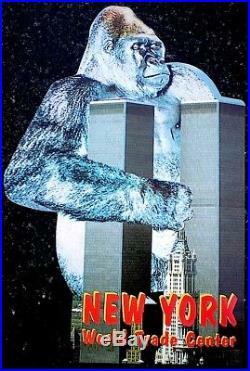 World Trade Center Pre 9/11 Observatory Ticket Adult + WTC King Kong Postcard MT. 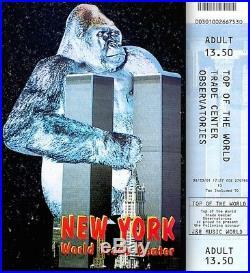 WORLD TRADE CENTER TOP OF THE WORLD OBSERVATIONS DECK ADULT TICKET INCLUDES PRE 9/11 KING KONG WTC TWIN TOWERS POSTCARD HISTORICAL COLLECTIBLE WITH LOA & RECEIPTS VINTAGE - AUTHENTIC ORIGINAL EXTREMELY RARE MINTY MINT!! 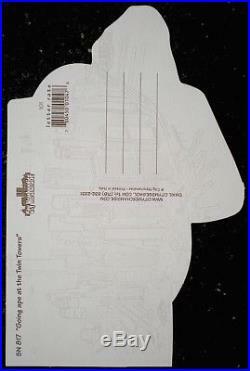 This ticket was printed inside the WTC before the tragedy. All remaining tickets & the printer used to print them were destroyed on 9/11. 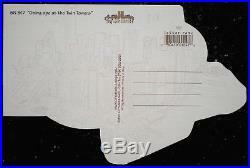 This is an unused WTC Ticket complete with the original perforated attached stub. Mint unused tickets are very rare as most were used to visit the World Trade Center Observation Deck. TICKET : COLOR: Blue - FRONT SIDE: Light Blue Photo of the Twin Towers & Statue Of Liberty, Barcode & Sponsor Info - BACKSIDE: Sponsor Promotion - J&R Music World with Olympus'Focus On Life'. 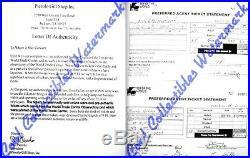 LOA - LETTER OF AUTHENTICITY & VENDOR'S RECEIPTS: LOA: Phil Piccolo's Validation Statement. Piccolo is president of Piccolo Gift Shop, Inc. & was an authorized preferred agent of the Top Of The World Trade Center. When the Twin Towers were destroyed on 9/11 they were left with unsold tickets & in desperate need of funds. Contains the Piccolo's business address, 2 typed paragraphs & signed. RECEIPTS: Piccolo Gift Shop Receipt Statement. This is a double statement which contains receipt info with the Piccolo's business address & the WTC business address, dates & signatures. Cool Collectibles will not appear on the LOA or Receipts. WTC TICKET INFORMATION: The tickets came in two types: Adult & Child. This makes the Child ticket incredibly rare & even more valuable! Please view the postcard's backside photo as you can see the Diecut more clearly... TOP OF THE WORLD TRADE CENTER OBSERVATORY HISTORY: The Top Of The World Trade Center Observatory was located in the WTC South Twin Tower #2. It had an indoor & outdoor observation deck that delivered a 360 degree view of New York City, allowing visitors to see up to 50 miles away with clear skies. Once purchasing the Top Of The World Trade Center Observatory admission tickets, spectators were taken on a six minute virtual helicopter ride heading out of Verrazano Bridge, flying over Central Park, through Times Square & back to the World Trade Center buildings. Kiosks were located at various points in the exhibit verbally explaining the displays in a number of languages. The Top Of The World Trade Center Observatory was complete with gift shops, a pro shop even a food stand structured like a subway car advertising Sbarro & Nathans Famous Hot Dogs. From the 107th floor, visitors took an escalator to the 110th floor to experience breath taking views of all of Manhattan. A view from the 110th floor of the World Trade Center South Tower was unlike any other with sights of Rockefeller Center, the Met Life Building, the Citigroup Center the Chrysler Building & the Empire State Building. Although there was an anti-suicide fence built to protect patrons from falling or jumping, it did not obstruct the observatorys spectacular views. WTC COLLECTIBLES HISTORY INFORMATION: The World Trade Center gift shops had beautiful collectibles & keepsakes from before 9/11. Incredible memorabilia that so many visitors & collectors loved. Before these collectibles were discontinued, we obtained what collectibles we could from the companies that provided the WTC gift shops. We stored them for 10 years & decided that on the tenth memorial of the 9/11 WTC we would present them once again. Every WTC collectible we are offering is a beautiful vintage Pre-9/11 WTC Twin Tower Treasure. As collectors ourselves, we hope you'll love & treasure this collection as we do... BEWARE: Tickets without their stubs or just the stubs are worth a fraction of the value of the same full complete ticket. THANKS FOR LOOKING COME BACK SOON MORE AWESOME TREASURES ARE ADDED WEEKLY!! PACKING METHODS: All flat paper items are sent in poly sleeves with over sized backing boards. Fragile and larger items are bubble wrapped and sent in sturdy boxes with peanuts. We maintain high standards on every level. CONDITION: Grading conditions are subjective. Records LPs 45s, CDs & DVDs. Promo Cereal & Snack Boxes. Movie & TV Show Memorabilia. Movie & TV Star Memorabilia. World Trade Center Twin Towers. PSA JSA CGC GAI PGX BGS. Computers, DVDs, CDs & Misc. _gsrx_vers_632 GS 6.9.8 (632). 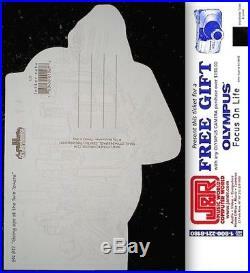 The item "World Trade Center Pre 9/11 2001 Observatory Ticket Adult WTC King Kong Postcard" is in sale since Monday, December 4, 2017. This item is in the category "Collectibles\Historical Memorabilia\Fairs, Parks & Architecture\Buildings". The seller is "thejackpot" and is located in Los Angeles. This item can be shipped worldwide.